This acknowledgement will give her the opportunity to spend a mobility period at CEREGE - Centre Europeen de Recherche et dEnseignement des Geosciences de lEnvironnement of Aix-en-Provence, within the PhD project dealing with the reconstruction of the glacial landscape in the Eastern Dolomites starting from the Late Pleistocene, an age affected by huge climate changes over thousands of years. 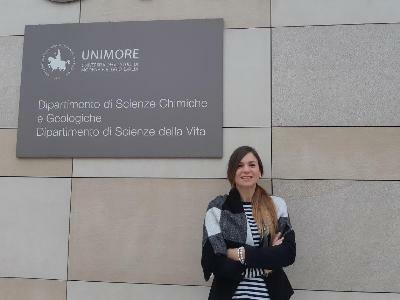 The study carried out by PhD student Vandelli and the prestigious study grant she deserved to be awarded with - professor Mauro Soldati remarked - confirm the importance of geological and geomorphological research in reconstructing the climates of the past, the knowledge of which is essential to analyse the climate changes that are currently affecting our Planet. Dating the glacial deposits identified in the Dolomites will be an additional puzzle piece, useful to define the chronology of glacier fluctuations that about 20,000 years ago widely covered our mountains. As Unimore PhD student Vittoria Vandelli commented, I am excited at this opportunity through which I will be able to deeply explore the research in the field of my PhD project, together with some of the major experts in the study of interactions between glaciers and past climates, by exploiting tools and dating techniques that are available in just a few laboratories in the world. The research activities at CEREGE will focus on dating glacial deposits by means of a technique known as "cosmic ray exposure dating", used for the first time in the high Dolomite valleys, referring to the chronological characterisation of such deposits.